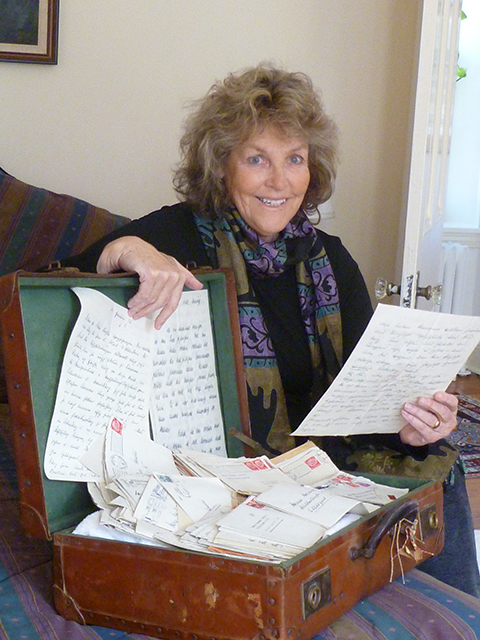 Brigitta Schuchert: How much had you known about your parents before reading the letters? How much of this was new information? Bettina Hoerlin: I knew outlines. Of course I knew my parents had met. I knew they had fallen in love. I knew they had immigrated to the United States in 1938. But there was so much I didn’t know. They didn’t want to talk about their past, even though my father was sort of this Aryan poster boy. He had climbed the highest mountains, and had been celebrated in Germany. This was a golden age of mountaineering. Nobody had ever conquered an 8,000-meter peak, you know. Everest hadn’t been conquered. None of these peaks had been conquered. He went on one of the very early expeditions, and tried to climb what they thought at the time was the second highest mountain in the world. I turned out to be only the third highest mountain. They didn’t conquer it because of extensive avalanches, but successfully climbed another nearby mountain, the highest summited to date. He had held a world record, and he was very modest about that. I didn’t realize how revered he was. And there was a movie made out of this 1930 International Expedition to the Himalaya, which was widely shown. I certainly did not know about his protests when he was part of the executive committee of the Alpine Club. Protests about the Nazification of German mountaineering. He never told me that, so this all came out in the research. I knew there were some Jewish roots there. I had no idea how difficult this made their relationship. And how difficult, if not impossible, it made it for them to get married. Racial laws forbid marriages between Jews and Aryans. They were the exception to the Nuremberg Laws, a rare exception. I’ve talked to historians and they say it couldn’t have happened. I show them the marriage certificate, which crosses out the part that says, “These are Aryans being married to one another,” and has written, “By special permission of the Fuehrer, she can marry.” I had no idea how much of a motivating factor this was in their leaving Germany. The other thing I didn’t know was my parents as lovers. We all see our parents as the adults. They are the people approving or disapproving of us, or supporting us. My parents were a loving couple, but in these letters there was the passion. It was just wonderful to think of your parents that way, you know? Just clearly so in love, and breaking the rules, as it were. That was a revelation. BS: How did your parents meet? BH: It was total serendipity. It was the early ’30s, and Germany was very depressed. [My mother’s] first husband, was a music critic, and he was offered a job as press secretary to a major German expedition to the Himalayas. This was a big deal expedition, to a mountain called Nanga Parbat. This had huge publicity, because it became politicized by Hitler, in terms of him saying, “We are going to be the first country in the world to conquer an 8,000 meter peak.” So they were press secretaries for this expedition, and my father had been invited on the expedition. My father didn’t go. He didn’t like the national tone of it, and his father had died and he felt that he needed to look after his mother, and sister, while he completed his doctoral studies in physics. This expedition, which was supposed to showcase Germany and Germans turned out to be greatest mountain climbing disaster to date. Ten people died over a week period. There were huge storms; people could hear their cries. It was grisly. In the meantime back in Munich there’s my mother, and her husband has just been killed. She’s getting all these telegrams of Germans wandering the mountain, so-and-so’s killed, and we heard his voice yesterday, and she said, “I can’t do this,” and she said to The Alpine Club, “Please send me somebody who can help me sort out what is truth, and what is not, so we can do a press release on this.” And they sent my father, from Stuttgart to Munich. So that is how they met. And I think he fell in love with her immediately. BS: And your mother was very involved after her first husband’s wrongful death with getting reparations. BH: Exactly. She was insistent on reparations, and she was fierce. She went to Berlin, she met with top Nazi officials. The other part of this story is that she had a protector, who was the top aide to Hitler, Hitler’s adjutant. His name was Fritz Wiedemann. BS: And Wiedemann ended up playing a pretty large role in the story, and helping your parents get to America. What was the process of researching him along your parents? Was there information in the letters? BH: There are numerous references to Wiedemann in the letters. I extrapolated that at one point. I think almost 100 references to him. He first of all helped my mother get reparations. Then there was the question of how she was going to classified. When the Nuremberg Laws were passed, people were classified as full Jews, half Jews, quarter Jews, et cetera. And how was she going to be classified in terms of her life in Germany, and whether she was going to be able to vote, whether she was going to be able to own property, because the laws said if you’re Jewish you can’t do all of this. He was very helpful in that regard too. Here’s another loop in the story, [my mother’s] birth certificate said that both her parents were Mosaish, which is of the tribe of Moses. But, it happened that her mother had a long-term affair with a Prussian count — who was not Jewish of course. There was this letter where this count said, “Yes, this my child,” and there was enough evidence that the Nazis did classify her as a mischlinge, which means of mixed race, which meant that she had a few more rights. Wiedemann was also helpful to my father in getting him transferred to the United States. So Wiedemann became really kind of a savoir to them in that regard. The irony of this happening all under Hitler’s nose is enormous. Wiedemann, then ends up as German Consul in San Francisco, for a couple of reasons. One, it became clear after Kristallnacht that he didn’t have a stomach for anti-Semitic terrorism. Furthermore, he was having an affair with a Jewish princess, a woman who was Jewish and had married into nobility. He had helped other Jews as well. It wasn’t just my mother. He was this fascinating character, neither black nor white, but sort of in this gray area. BS: What was the process like of reading the letters between 1934 and 1938? There’s a point in the book where you mention the letters becoming more coded, and this increased awareness of how dangerous it was. BS: In the book you mention your first visit to Germany. I was wondering if you could talk about that experience. BH: I’d grown up during the war, and it was not cool to be German. I didn’t really want anything to do with that. But I had never met my grandmother, so [in 1952] at the age of thirteen I went with my father to Germany. And it was like, opening up the world. You have your prejudice, you have your mindsets — and it was just a totally different kind of experience for me. I could still see at that point the scars of war, in Germany. You had bombed-out sections, so there was always a little bit of that ghost there. I felt much more open to Germany after that. Well, when I wrote the book, it was such a huge emotional experience for me. It was totally absorbing. I was living these two lives. I had this life in Philadelphia, and then I had this life that I had just been writing about. So, when I started presenting about the book, people would say, “Oh, what’s your next book?” And I’m sort of looking at them cross-eyed. I’ve really gotten very interested in Wiedemann, as a very checkered character. We are very quick to put people into corners, good, bad, and et cetera. But here was this man who was obviously swayed by the Nazi doctrine at some point, and yet ends up helping Jews and is ready to be part of a resistance against Hitler — then is regarded as a war criminal by the United States, although he had not been in Germany at all during the war. The complexity of him as a character interests me. And to extrapolate that in terms of how we ourselves deal with the goods, the bads, the blacks, the whites — and boxes. That’s what I’ve been looking at. BS: When was the point that you decided that you wanted to turn the story of your parents into a book, when did you decide that was the future for it? BH: About eight years ago I said, “You know Bettina, you have to do something with these letters, and nobody else is going to do it. You’re going to have to do it.” It took me about a year to get through translating the letters, and I wrote them up in English and circulated them to my family. And then I said, “Wait a second. Here’s a story.” I said, “I have to write this, because this is a universal tale. It’s a universal tale of courage, it’s a universal tale of how people deal with a rising political movement that would affect their lives, and other peoples’ lives even more so, horrendously.” That’s when I knew I had to write a book, and that’s when I quit teaching. I had never written a book, but this was burning inside me. Brigitta Schuchert graduated from Bryn Mawr College in 2014, with a B.A in Religious Studies. She is currently a Writing Fellow at NYU Abu Dhabi. Next in Conversations with Authors: Joey Bui talks with “uncreative” writer Kenneth Goldsmith.